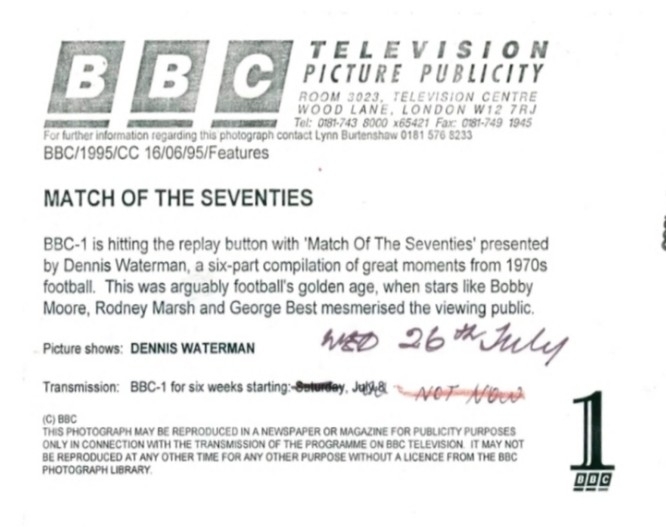 Match of the Seventies, was a nostalgic TV series, presented by football fan Dennis Waterman , there were two series, shown by the BBC, the first series (first shown in 1995), covered the English football seasons, from 1970-1976, and the second series (first shown in 1996), covered the English football seasons, from 1976-1980, there was also a fifth episode (called The Greatest Hits), in the second series, which looked back over the decade, the series featured lots of great archive footage, from the 1970's, featuring many great players (Keegan, Best, Osgood, Dalglish and many others) and managers (Shankly, Clough, Revie, Paisley, Robson and many others), and interviews with former players and managers, from the 1970's, many memorable matches, were featured in the series, Match of the Seventies, was great viewing, for me, because Liverpool (the team that I support), won many trophies, in the 1970's, I am sure there are other members, on this forum, who can remember watching Match of the Seventies, the series, can be seen on YouTube. I saw this when it was on, but would probably not return to it. 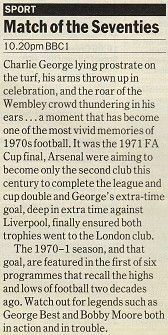 This is nostalgia for those from the time and sadly nostalgic footie isn't really my thing. 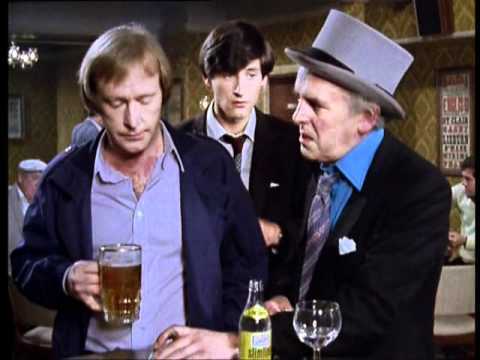 Always great to see our Dennis having a earning a wedge for something he enjoys though. I liked it at the time but I wouldn't rewatch it. 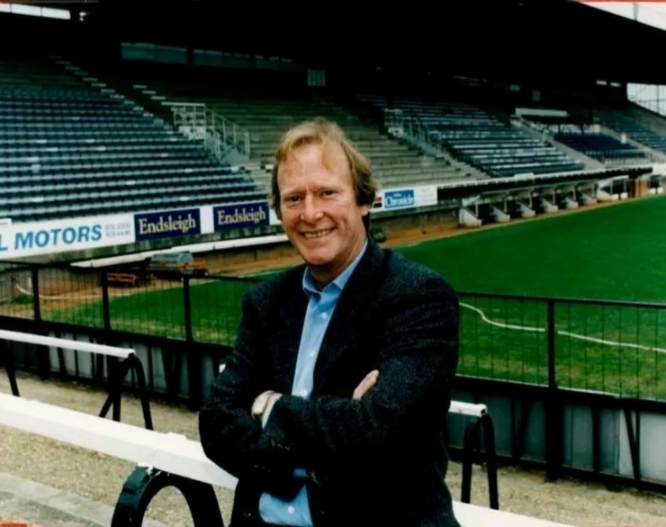 There were also similar programmes for the 80s and 90s. It has been mentioned on the forum briefly elsewhere and I really enjoyed it and would happily watch it again. I thought Dennis did a great job of presenting this and his love for the game was obvious. It was only watching this, upon original transmission I realised he supported Chelsea, I honestly thought he was Fulham. 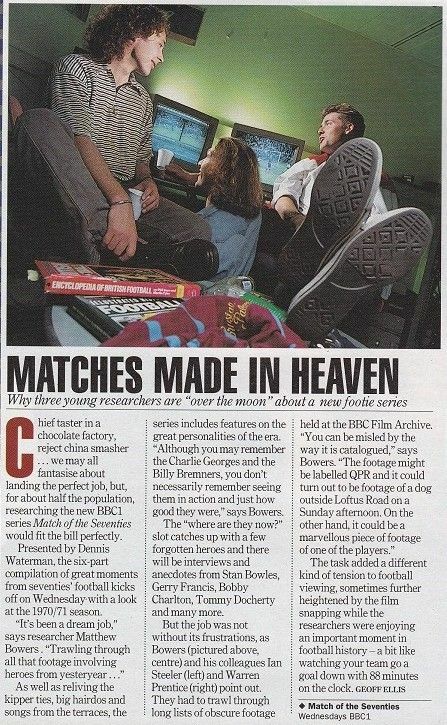 A very interesting Radio Times feature, from the July 22nd - 28th 1995 issue of Radio Times. of Radio Times, as above feature. issue of Radio Times, as above feature and preview). Is that THE Chris Kelly from Clapperboard/Food & Drink producing Match Of The Seventies? I clicked on the link out of curiosity. It was amusing to see Dennis pull up in a white Capri. His enthusiasm for the topic is obvious from the start and he was a good choice to host it. Something was wrong and I could only see the first few minutes but it looked kind of interesting and I'm an American with no interest in sports. Remember this back in the long hot summer of 1995. 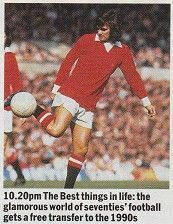 From this pic it looks like they planned to show it in the Saturday night Match of the day slot, but remember it was on mid week. Your spot on McCann it was mid week.